The Minister of Justice in Iceland is the head of the Ministry of Justice and forms a part of the Cabinet of Iceland. The ministry was formed in 2017 and the current minister is Sigríður Á. Andersen. Sigríður Ásthildur Andersen is an Icelandic politician and lawyer who served as the Minister of Justice of Iceland from 2017–2019. She resigned as minister of justice after the European Court of Human Rights found her appointments of judges to the Icelandic court of appeals to be illegal. The Minister of Justice and Ecclesiastical Affairs was the head of Ministry of Justice and Ecclesiastical Affairs, which existed between 1 January 1970 and 1 October 2009. Before the Cabinet of Iceland Act no. 73/1969 took effect, ministries in Iceland had not existed separately from the ministers. Between 4 January 1917 and 1 January 1970, the minister responsible for justice was titled Minister of Justice and the minister responsible for ecclesiastical affairs was titled Minister of Ecclesiastical Affairs. In cases where one person was responsible for both, he or she was titled Minister of Justice and Ecclesiastical Affairs. On 1 October 2009, the position became Minister of Justice and Human Rights (Icelandic : Dómsmála- og mannréttindaráðherra) and the ministry itself was renamed accordingly. On 31 December 2010, the Ministry of Justice and Human Rights was merged with the Ministry of Transport, Communications and Local Government to form the Ministry of the Interior. On 1 May 2017 the Ministry of the Interor was again split up into the Ministry of Justice and the Ministry of Transport and Local Government. An interior ministry is a government ministry typically responsible for policing, emergency management, national security, registration, supervision of local governments, conduct of elections, public administration and immigration matters. Such a ministry is often headed by a minister of the interior, a minister of internal affairs or a minister of home affairs. In some countries, matters relating to the maintenance of law and order and the administration of justice are the responsibility of a separate justice ministry. The Cabinet of Malaysia is the executive branch of Malaysia's government. Led by the Prime Minister, the cabinet is a council of ministers who are accountable collectively to the Parliament. According to the Article 43 of the Constitution, members of the Cabinet can only be selected from members of either houses of Parliament. Formally, the Yang di-Pertuan Agong appoints all Ministers on the advice of the Prime Minister. The constitution is amended by repealing the Clause (8) of Article 43, enabling a person who is a member of State Legislative Assembly to continue to be one even when he or she is appointed as a minister or deputy minister in the cabinet. Ministers other than the Prime Minister shall hold office during the pleasure of the Yang di-Pertuan Agong, unless the appointment of any Minister shall have been revoked by the Yang di-Pertuan Agong on the advice of the Prime Minister but any Minister may resign his office. In practice, the Yang di-Pertuan Agong is obliged to follow the advice of the Prime Minister on the appointment and dismissal of ministers. The government of Montenegro is the executive branch of state authority in Montenegro. It is headed by the prime minister. It comprises the prime minister, the deputy prime ministers as well as ministers. The Australian Minister for Home Affairs is a ministerial portfolio formed at the Federation of Australia and has undergone numerous changes in ministerial responsibility since 1901. Much like the history of the United Kingdom Home Office, the Australian Department of Home Affairs has been responsible for a vast array for internal matters since Federation including immigration, transport, agriculture, industry, territories, elections, women's affairs, the National Archives, and the public service. The Government of Hungary exercises executive power in Hungary. It is led by the Prime Minister, and is composed of various ministers. It is the principal organ of public administration. The Prime Minister (miniszterelnök) is elected by the National Assembly and serves as the head of government and exercises executive power. The Prime Minister is the leader of the party with the most seats in parliament. The Prime Minister selects Cabinet ministers and has the exclusive right to dismiss them. Cabinet nominees must appear before consultative open hearings before one or more parliamentary committees, survive a vote in the National Assembly, and be formally approved by the President. The cabinet is responsible to the parliament. The Icelandic Ministry of Justice and Human Rights was a cabinet-level ministry within the government of Iceland. Since 2 September 2010, the minister had been Ögmundur Jónasson. The institution was previously known as the "Ministry of Justice and Ecclesiastical Affairs". The Icelandic Ministry of Communications was a cabinet-level ministry responsible for transport by land, sea and air, as well as telecommunications and postal services. Since September 2010, the minister had been Ögmundur Jónasson of the Left-Green Movement. Various organisational changes has taken effect in the Ministry of Transport, Communications and Municipal Affairs. A number of projects have been transferred to the Ministry, which has expanded its staff by 8 employees to a total of 36. The Minister of Transport and Local Government in Iceland is the head of the Ministry of Transport and Local Government and forms a part of the Cabinet of Iceland. The ministry was formed in 2017 and the current minister is Sigurður Ingi Jóhannsson. The Ministry of the Interior is a department of the Government of Spain responsible for public security, the protection of the constitutional rights, the command of the law enforcement agencies, national security, immigration affairs, prisons and road traffic safety. The Minister of the Interior was the head of Iceland's Ministry of the Interior from 2011 to 2017. 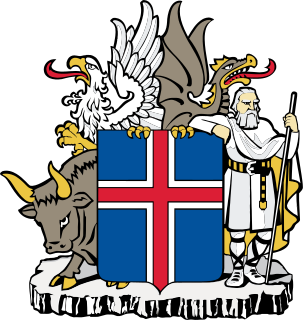 The Cabinet of Bjarni Benediktsson in Iceland was formed 14 November 1963. It dissolved 10 July 1970 due to the death of the Prime Minister, Bjarni Benediktsson, who was killed in a house fire the night before along with his wife and grandson. The Cabinet of Sigmundur Davíð Gunnlaugsson in Iceland was formed 23 May 2013. The cabinet left office 7 April 2016 due to the Panama Papers leak. ↑ "Frumvarp til laga um Stjórnarráð Íslands" [Bill regarding the Cabinet of Iceland.](PDF). Legal Code (in Icelandic). Parliament of Iceland . Retrieved 13 November 2012.